MXF Video Converter, the professional and flexible MXF/P2 MXF Transcoding Software, offers the best MXF converting solution for users of Panasonic DVCPRO P2, Sony XDCAM, Canon XF camcorder, or any other camcorders that shoot videos in MXF format. 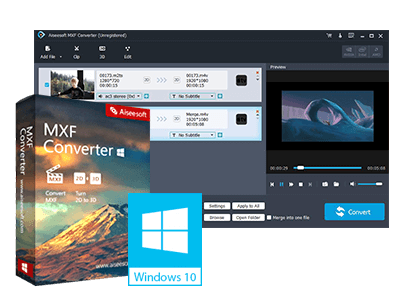 This amazing software can convert MXF files for editing in various video editing software, such as Sony Vegas, Adobe Premiere, Avid Media Composer, Windows Movie Maker, Magix Movie Edit Pro, Ulead DVD MovieFactory, Cyberlink PowerDirector, and so on. The versatile MXF Video Converter can convert MXF to any other popular and multi-compatible video and audio formats such as MP4, AVI, MPEG, M4V, 3GP, WMV, and M4A, etc. Moreover, this software can convert MXF to 3D videos. With it, users can easily enjoy MXF files on some portable devices. Also this MXF Converter provide users with some basic video editing features for you to get perfect output video quality. Tips: Happy 2015!! 15% Discount for MXF Video Converter Windows & Mac. It offers the best MXF converting solution for users of Panasonic HC-V720, Sony HDR PJ, Sony XDCAM, Canon Vixia HF R or any other camcorders that shoot videos in MXF format. With the transcoding function, you are allowed to convert MXF video shot by Panasonic P2/ Sony XDCAM/ Canon XF MXF to formats supported by various Video Editing Software tools, including Sony Vegas, Adobe Premiere, Avid Media Composer, Windows Movie Maker, Magix Movie Edit Pro, Ulead DVD MovieFactory, Cyberlink PowerDirector, etc. Convert MXF and HD video format to any popular video. This MXF Video Converter allows you to convert MXF video that recorded by professional camcorders to popular video formats without losing the original quality. It can convert MXF to any other popular and multi-compatible video/audio formats and HD video formats, such as H.264/MPEG-4 AVC, WMV HD Video Files, HD TS, HD MTS, MP4, 3GP, AVI, MKV, WMV, FLV, SWF, VOB, DV, and MPG, etc. By adjusting the parameter settings, you are allowed to retain the original quality to the largest extent. Also it can encode MXF footage in full 1080p HD quality. It is available to transcode Panasonic P2/ Sony XDCAM/ Canon XF MXF recordings to play well on Apple devices, Android devices, game players, HD Media Players and website, especially for iPad 2, The new iPad, iPhone 4S, Galaxy Tab, Motorola Xoom, HTC, PS3, Xbox360, Wii, YouTube, Facebook, etc. This professional MXF Converter can help users convert standard MXF video to 3D modes with perfect output 3D effect. This software offers several 3D modes (Anaglyph 3D, Side by Side (Half-Width) 3D, Side by Side (Full) 3D, Top and Bottom (Half-Height) 3D and Top and Bottom (Full) 3D) for you to choose. You can freely choose any one according to the requirements of playback equipments. Also you can adjust the 3D depth to get a perfect 3D playing effect. With the multiple editing functions, this MXF Converter enables you to crop, watermark, and merge MXF recordings. You can crop the video frame to remove the blank edges, add text/image watermark and define the text color, and merge several videos into one file. Also you can adjust the video brightness, saturation, contrast, hue, and volume. You can get several video clips from source MXF file. Even you can set the length and different output format for each clip. MXF Converter has the ability to set output profile such as Video settings and Audio settings. Video settings include Video Encoder, Frame Rate, Video Bitrate, Resolution. And Audio Settings include Audio Encoder, Sample Rate, Channels, Audio Bitrate. Choose audio track and subtitleYou are allowed to choose the preferred audio track and subtitle for your output video. MXF Converter can convert several MXF files in different output video formats simultaneously, and also can convert different source file formats in only one conversion click. It supports previewing the original and output video effect at the same time when editing the video file, and helps you capture the favorite image while preview in the main interface with the “Built-in-player”. With the intuitive and ergonomic interface, you can easily finish the converting process just in a few clicks, and the supported NVIDIA® CUDA™ and AMD APP acceleration technology completely supports multi-core processor. Tips: Happy New Year!! 15% Discount for MXF Video Converter Windows & Mac. Apple iPad/iPad 2/iPad 3/iPad 4/iPad Mini/iPad air, Apple TV/ATV 2/ATV 3, iPhone 4/4s/5, iPod Touch 4g/5g, PSP, PS3, PS Vita, Xbox 360, Microsoft Surface Tablet, Motorola Xoom/XOOM 2, Sony Tablet S/Tablet P, Transformer Pad TF300, Asus Eee Pad Transformer, Transformer Prime, Samsung Galaxy Tab/Galaxy Tab 2, Samsung Galax Tab 10.1,Samsung Galaxy S III, Galaxy Note 2, Google Nexus7, Kindle Fire, WDTV, Popcorn Hour, Xtreamer, HDTV, Media Player, QuickTime Player, VLC, etc. Widnows Movie Maker, Sony Vegas, Adobe Premiere Pro/Elements/Express, After Effects, Nero, Avid, CyberLink PowerDirector, Roxio Creator, Pinnacle Studio, Encode, etc. Windows DVD Maker, Nero Lite, ImgBurn, CDBurnerXP, FinalBurner Free, Ashampoo Burning Studio, InfraRecoder, StarBurn, DeepBurner, Alcohol 120%, DVDFab DVD Copy, etc. NAS, PPT, PDF, Home Theater, NAS, Samsung SP-H03 Pico Projector, Networked Devices, etc. H.264/MPEG-4 AVC (*.mp4), H.264 HD Video (*.mov), QuickTime HD Video (*.mov), WMV HD Video (*.wmv), MPEG2 HD Video (*.mpg, *.mpeg), MPEG TS HD Video (*.ts), DivX-HD (*.avi), MP4, AVI, MKV, WMV, MPG, MPEG, FLV, F4V, 3GP, MOV, ASF, 3G2, SWF, VOB, TS, DivX, XviD, DV, VCD/DVD/SVCD, M4V, etc. MP3, AC3, AAC, FLAC, AIFF, WMA, WAV, OGG, M4A, MP2, AMR, SUN, MKA, etc. JPG, BMP, TIFF, BMP (As thumbnails).